Come visit Garden of Eden Apothecary and step into a magical world, a place of refuge, love and beauty! We have been mesmerizing our patrons for close to 20 years with organic, ethically wildcrafted, and biodynamic offerings. 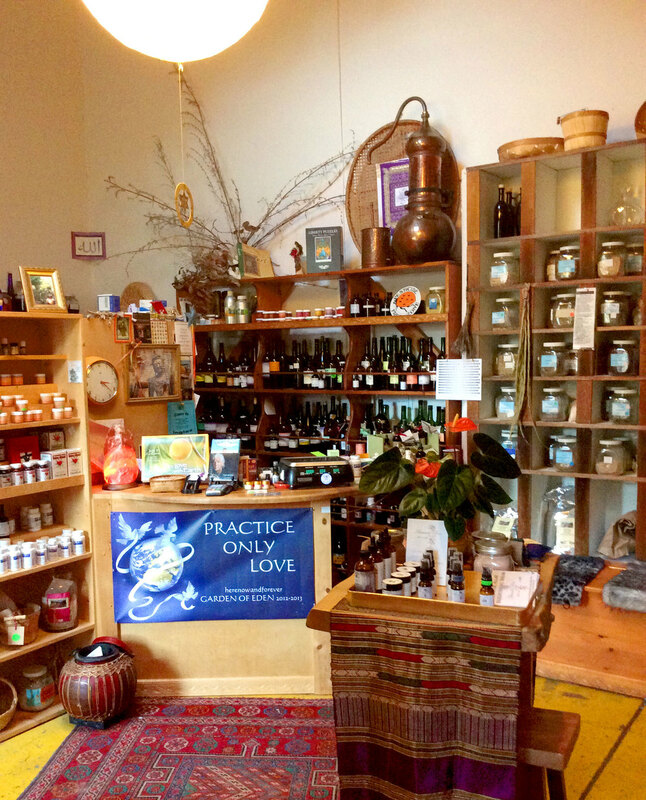 Our Point Reyes shop is a treasure trove filled to the brim with botanical gems, divine aromas, colors and healing gifts. Garden of Eden carries over 150 dried botanicals, one hundred tinctures and glycerites, plus many Essential Oils, including several unique and hard to find varieties! The Apothecary is the source for all of Eden's Healing products. Our flagship Healing Salves, Creams and Flower Essences are Hand-crafted in small batches saturated with love, intention and the purest quality, organic ingredients that can be found. Most of the herbs and flowers in our salves and creams are raised in Eden's organic gardens and used fresh shortly after harvest. We intentionally shop local and draw on a thriving web of herbal practitioners, growers and healers throughout Northern California to provide you with the finest and freshest botanicals. We carry naturopathic supplements from the Western, Chinese and Ayurvedic traditions, excellent books, healing Himalayan salt lamps, culinary herbs and beeswax candles. There is an abundance of herbal, botanical and nature inspired delights waiting to be encountered to share their essence and wisdom with you! Whether you are curious, on a mission to find a specific remedy or just searching for a well-being oasis, we can help! The Garden of Eden Apothecary staff is well known for the support and wisdom we offer our clients. Each woman who works here has training in Herbalism, Yoga, Nutrition, and Energetics. We deeply listen and then weave all of this wisdom into the support and guidance we offer our clients. Stepping into the Apothecary will captivate your senses and beyond! It’s a healing sanctuary that will inspire your heart. The fast paced world around you will come to a stop the moment you set foot in the shop. Come visit us and get ready to instantly step into the Present moment and miracles of life! For 40 years I have experienced the blessings of the Healing Herbs. Through their ongoing presence I have grown exponentially, shed many layers of physical and emotional discomfort and illness, and actualized my spiritual purpose. Having experienced the gift of self-healing a pre-cancerous cervical condition with Herbs and Spirit led me to the lifelong study and practice of Herbalism, Yoga, Massage and Spiritual Healing. In 1997 I founded the Garden of Eden Apothecary to benefit our coastal communities. It has become a steady beacon of healing, hope, community sharing and building. From soil building, seed planting, plant nurturing to collecting and producing Healing Salves, Creams, Tinctures and Flower Essences, my life revolves around Nature's cycles. Ancient wisdom passed through endless generations to support well being and healing, Nature's Way, these remedies now serve families all over the US and abroad. My love for our precious Earth, Gaia, inspires my daily life; these past four decade in West Marin county have nurtured, nourished, informed and mentored me, transforming me into being indigenous to this place. This profound kinship translates into activism in all aspects of Her care: from organic gardening, botanicals and vegetables raising, compost making, water conservation, seed saving, Community building, supporting and guiding my sisters and their families through the Birthing process and teaching to being at the Nevada Nuclear test site and at home standing firm in and for the sanctity of the Land; saying NO to nuclear weapons, pesticides and finding non-toxic solutions. Looking down at my own feet, I recognize the loving and fierce presence of the light of the previous generations whose love and dreams brought us here. Thank you, my wonderful parents and maternal grand-mother for sharing your horticultural and healing gifts, Paris of my youth for endowing me with great love for History, beauty and trees; my beloved children Eve, Marie and Forest for being my first spiritual teachers and growing with me, in love; Creator for the gift of this precious lifetime, Gaia, our radiant plant People and community, seen and unseen, the wisdom teachings of the indigenous People of North and Central America, India, Tibet and the Sufi Path, all my Herbal and Healing teachers and allies, my students and clients the world over for carrying forward the light of this Healing Herbal tradition. May Gaia's magnificent bouquet of offerings continue finding a home within your heart and support your journey toward balance, peace, abundance and happiness! We are a Bay Area Certified Green Business; our shop runs on Solar Energy, and we are radical Recyclers, Reducers, Reusers and Refusers! We work diligently to ensure that all the products offered at our shop embody the highest values around protecting and honoring our Divine Mother Earth and precious Waters. This commitment is a core essence of our shop and infuses every aspect of the Garden of Eden's offerings. Thank you for caring with us! Eden has been an artist, advocate, healer and activist for the planet in her community for several decades. From the close review of each supplier's environmental impact, to use of recycled and non-toxic packaging materials, from capturing grey water for the garden, to encouraging customers to go bag-free whenever possible, the Garden of Eden is devoted to honoring the reciprocal relationship of every material gift the earth generously and abundantly offers. When you shop with Garden of Eden, you are stepping into a loving partnership with us, yourself and the Earth - if we can offer healing and respect to the planet, we can take one more step towards healing ourselves, as we are one and the same. The shop would not be the magical healing place that it is if it were not for you, the radiant, big-hearted souls that walk through the door from all around the world, open to receiving and being embraced, carrying stories of where you are coming from and where you are going. You beauties, who travel from near and far to come to our region and to our shop, mingle with the jewels at the core - you local friends that come by regularly to pop in and share your own spirit, gifts and healing to me and everyone else in there. The spontaneous friendships and inspiring conversations that happen here are a part of what this shop is truly about, and a great source of healing for me, as the founder, and an offering for everyone new who walks in the door. So thank you, Beloveds, for stepping through the threshold and holding your piece of the shop!